However, technological competition in the automotive industry in areas such as information technologies has been evolving rapidly. As you may know, Suzuki's current business focuses on minivehicles in Japan, and in India, when it comes to operations outside of Japan. Even in such countries, we have understood that there will be uncertainty in the future if we only continue to just refine our traditional automobile technologies which we have been working on thus far. I have been discussing these issues with Toyota's Honorable Chairman Shoichiro Toyoda at various times, and quite recently―I think it was less than a month ago―I ventured further to discuss with him about whether we can explore on ideas to collaborate with Toyota. We were pleased that he had responded that "It would be good to at least discuss the potential collaboration between the two companies." 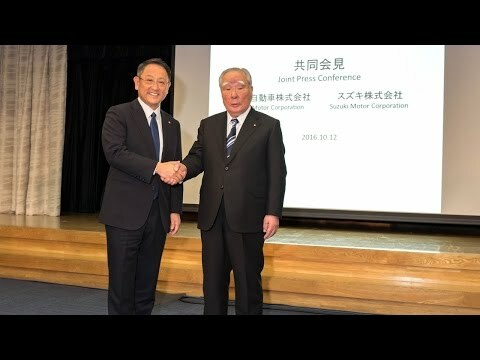 I am very grateful to President Toyoda for accepting our idea to start the discussion, and I am determined to proceed with it for Suzuki's future. In addition to efforts to tackle environmental and energy issues, as well as to ensure our customers' safety and security, we are required to work on the R&D of advanced and future technologies, such as on automated driving.